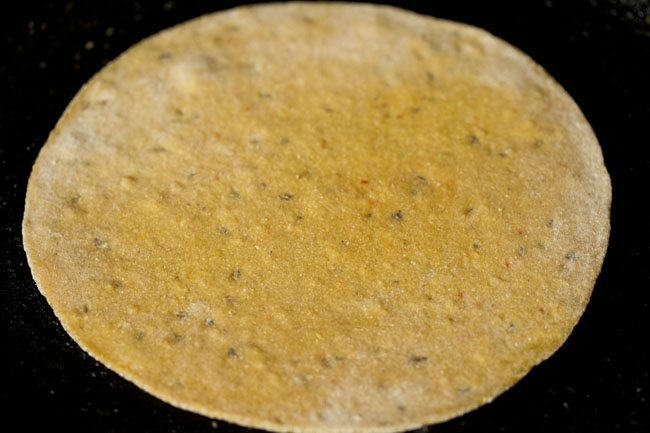 masala paratha - spiced unleavened whole wheat flat breads. 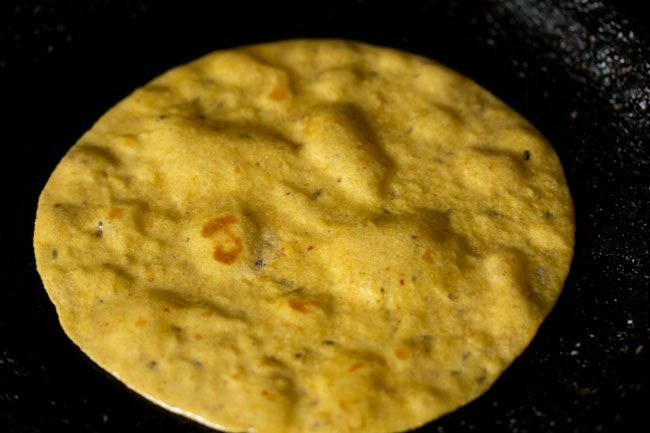 masala paratha is a variation of plain paratha with some spices added in it. 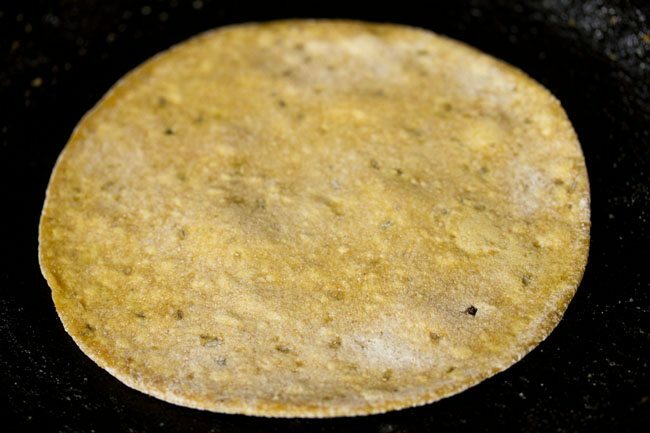 masala paratha recipe with step by step photos – spiced unleavened whole wheat flat breads. 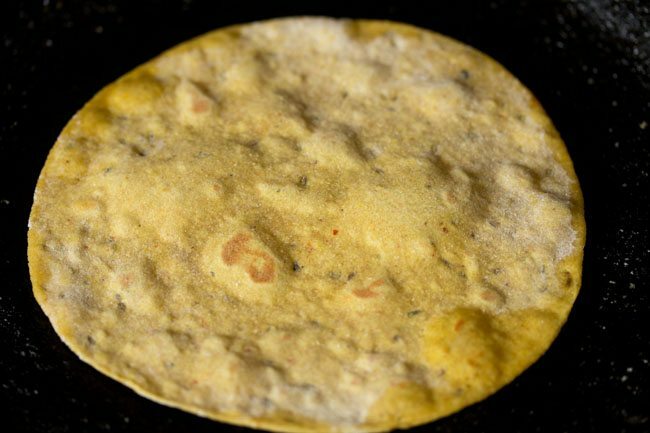 masala paratha is a variation of plain paratha with some spices added in it. spices are also called as masala or masale in hindi, hence the name. 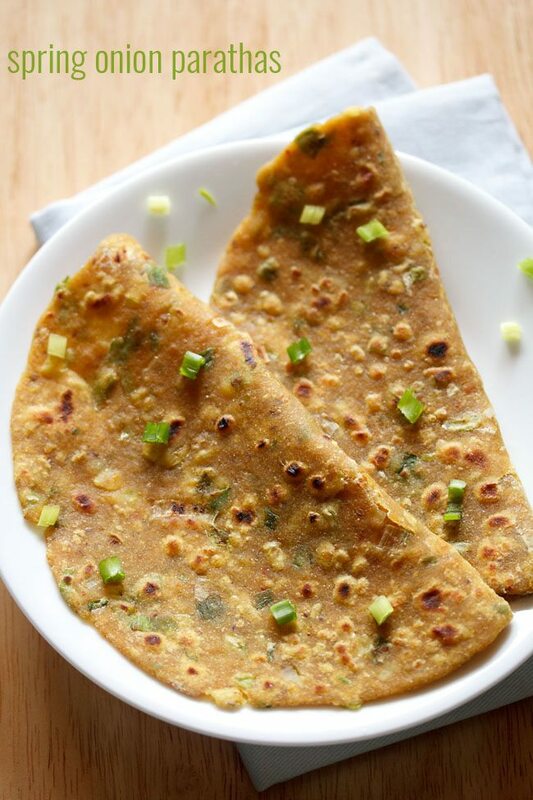 masala paratha are spiced but not spicy or hot. though you can increase the red chili powder and garam masala powder to increase the spiciness in the parathas. 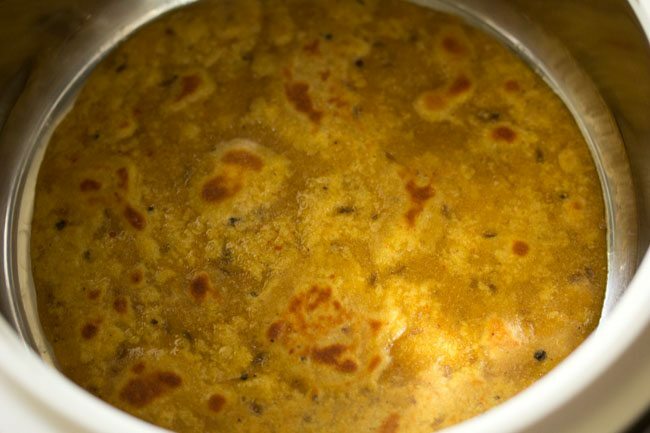 you can serve masala paratha with any dry veggie dish or gravy dish. 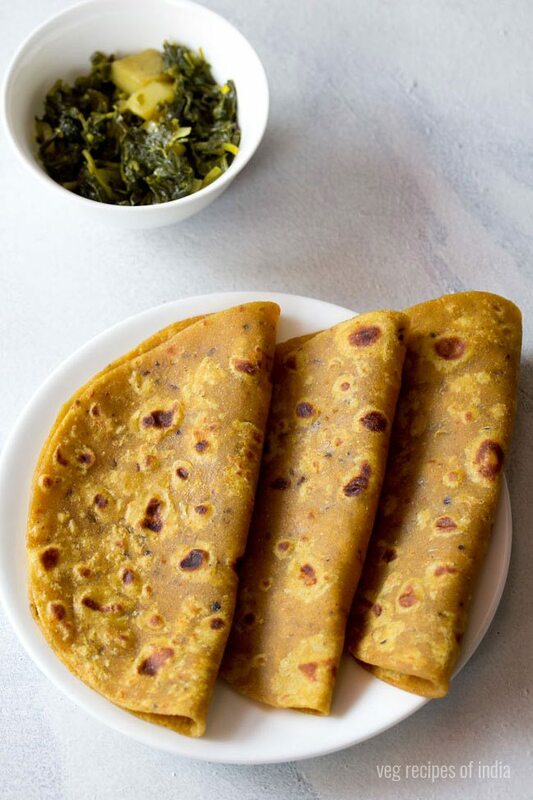 these spiced parathas also tastes good with some sour or sweet mango pickle or lemon pickle. in fact you can also have them with chai. 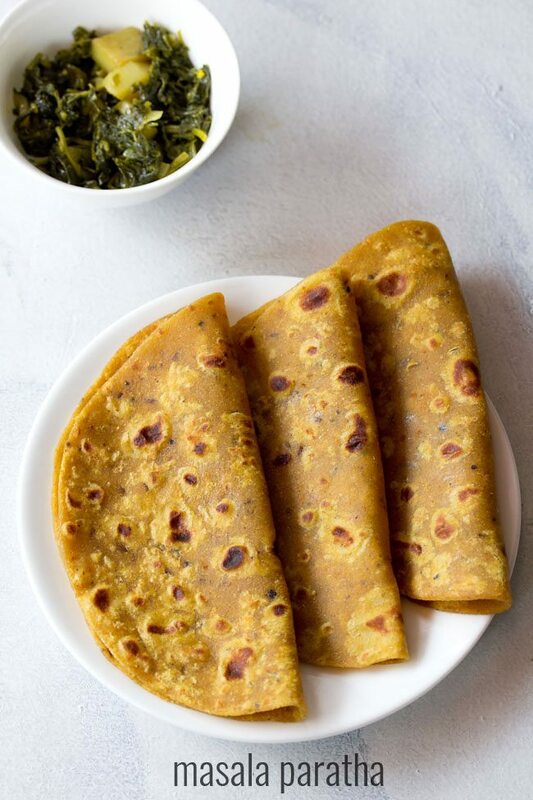 masala parathas with chai is one of our favorite combinations. but on this day, i had made aloo methi to go with the masala paratha. these parathas stay soft, so you can even pack them in tiffin. 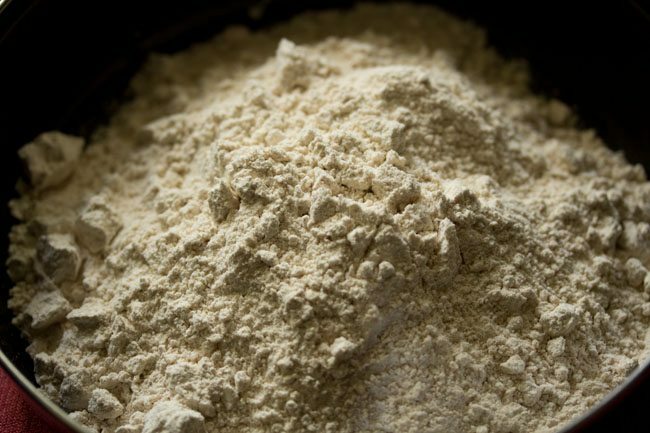 take 2 cups whole wheat flour/atta in a mixing bowl or a large plate. 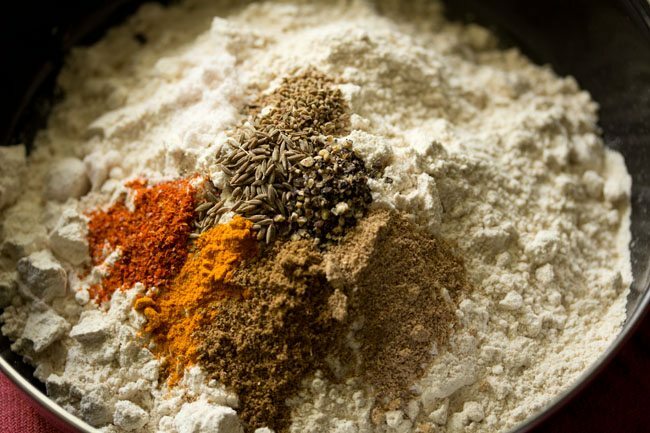 add all the spices - 1/4 teaspoon cumin seeds, 1/4 teaspoon carom seeds, 1/4 teaspoon crushed black pepper, 1/4 teaspoon red chili powder, 1/4 teaspoon turmeric powder, 1/2 teaspoon garam masala powder and 1/2 teaspoon dry mango powder. also add salt as per taste. add 1 tablespoon oil and 1/2 cup water. mix well and begin to knead. add water in parts while kneading. i used overall 1 cup water while kneading. depending on the quality of flour you can add less or more water. knead to a smooth and soft dough. 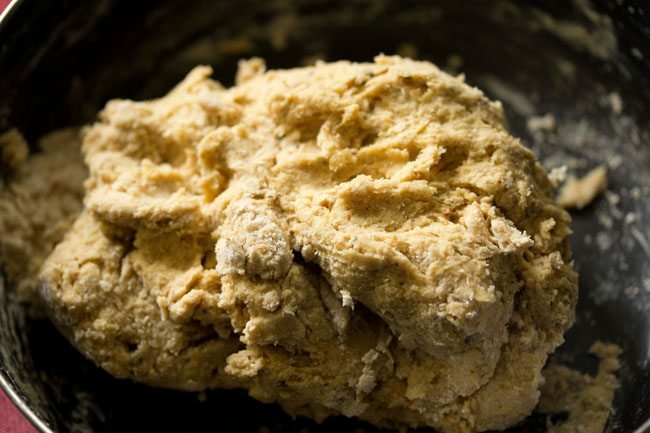 cover and allow the dough to rest for 30 minutes. again lightly knead once more and make medium sized balls from the dough. on a rolling board, dust one dough ball with some flour. let the paratha cook on a medium to high flame. 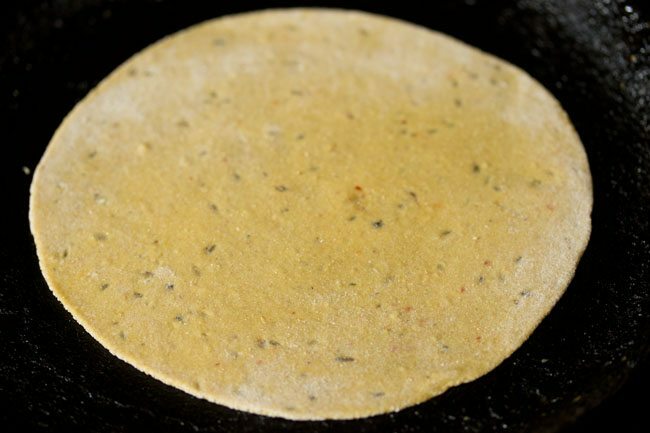 when one side is partially cooked, about ¼ cooked, then flip the paratha. flip a couple of times, till the paratha is evenly roasted and cooked. press the edges with a spatula so that they are also evenly roasted and cooked. 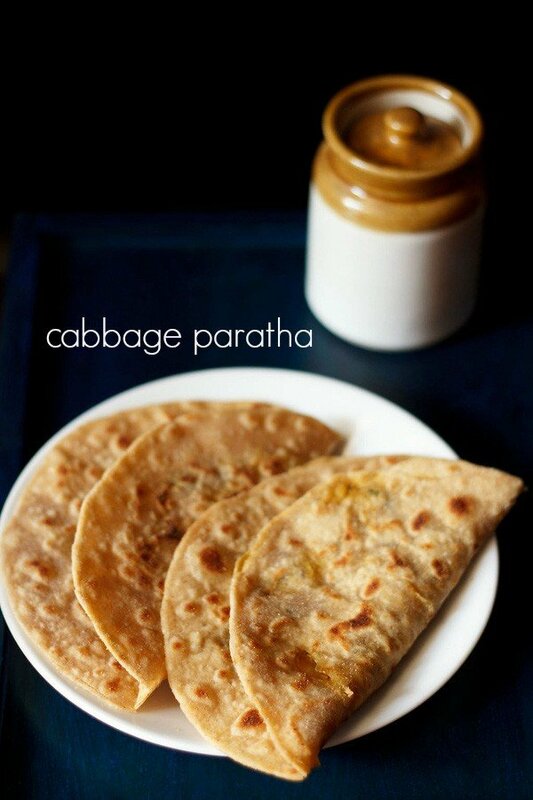 cook the paratha till you see golden blisters on top and they are evenly roasted. prepare all parathas this way. serve them hot or stack them in roti basket or a warm casserole. 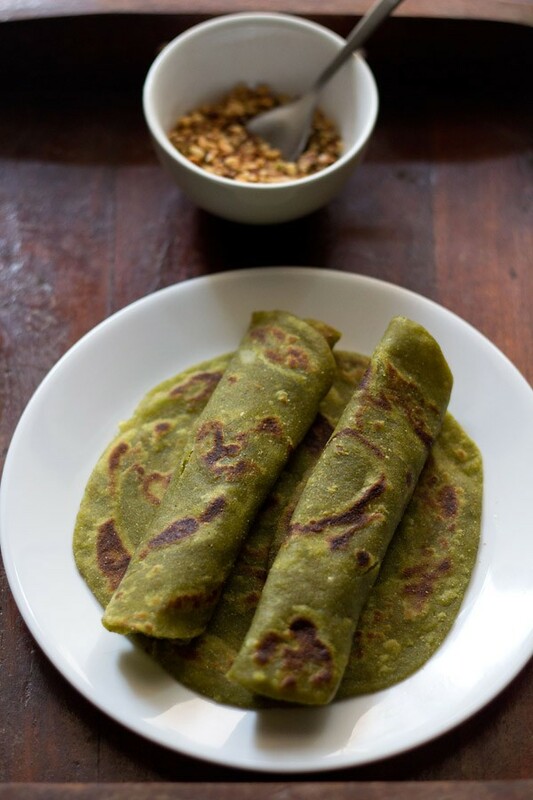 serve masala parathas hot or warm with any veggie dry sabzi or a gravy. you can also serve masala parathas with mango or lemon pickle or fresh curd. 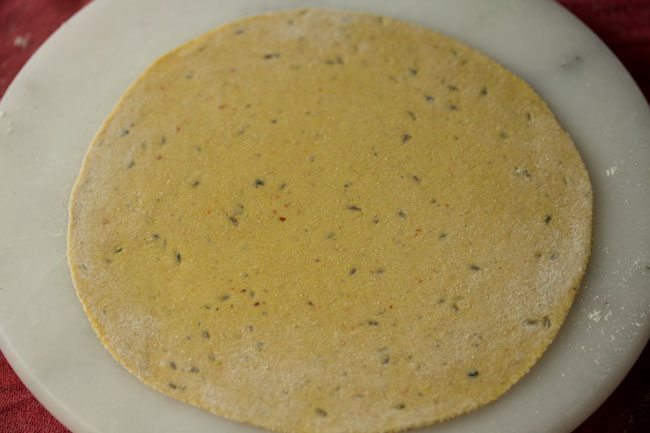 if you want the paratha to be spicy, then increase the red chili powder and garam masala powder. 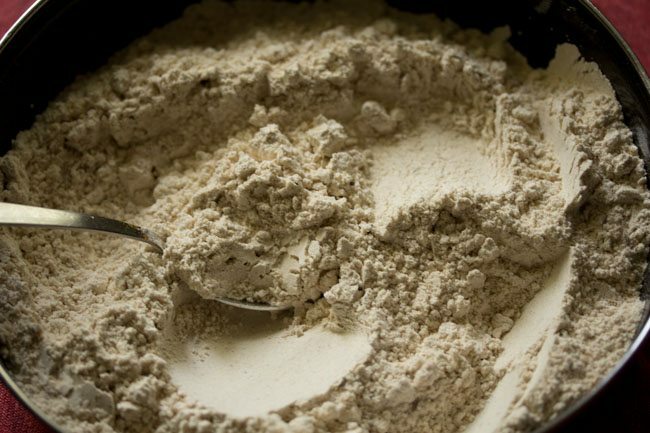 1. take 2 cups whole wheat flour/atta in a mixing bowl or a large plate. 2. add all the spices – ¼ teaspoon cumin seeds, ¼ teaspoon carom seeds (ajwain), ¼ teaspoon crushed black pepper, ¼ teaspoon red chili powder, ¼ teaspoon turmeric powder, ½ teaspoon garam masala powder and ½ teaspoon dry mango powder. also add salt as per taste. 4. add 1 tablespoon oil and ½ cup water. 5. mix well and begin to knead. add water in parts while kneading. i used overall 1 cup water while kneading. 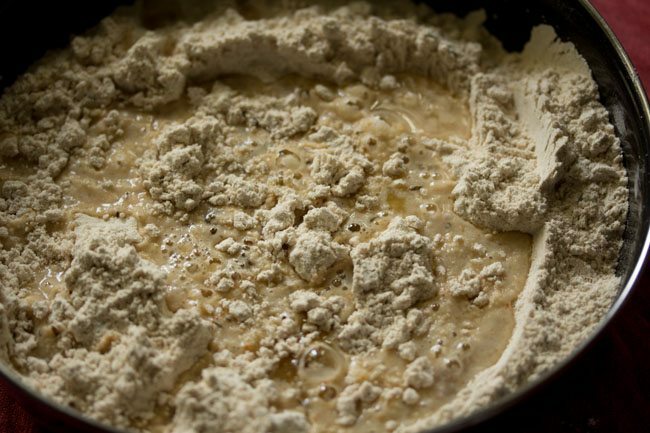 depending on the quality of flour you can add less or more water. 6. knead to a smooth and soft dough. cover and allow the dough to rest for 30 minutes. 7. again lightly knead once more and make medium sized balls from the dough. 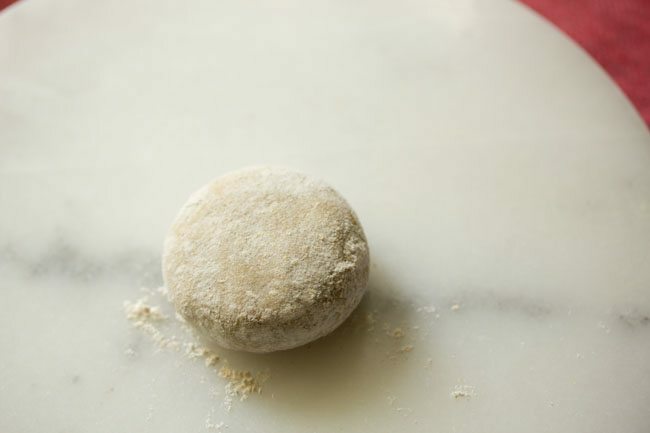 8. on a rolling board, dust one dough ball with some flour. 11. let the paratha cook on a medium to high flame. 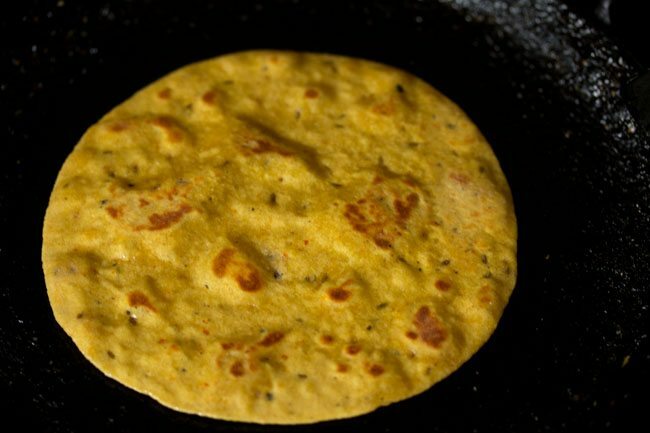 12. when one side is partially cooked, about ¼ cooked, then flip the paratha. 13. spread some oil or ghee on this partially cooked side. 14. flip again when the second side is half cooked. 15. spread some ghee or oil on this side too. 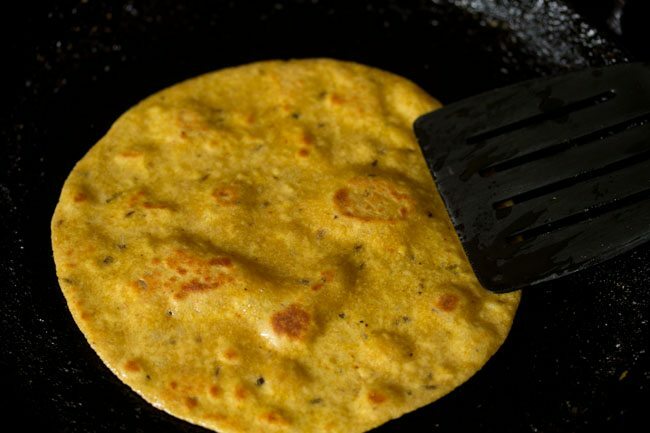 16. flip a couple of times, till the paratha is evenly roasted and cooked. 17. press the edges with a spatula so that they are also evenly roasted and cooked. 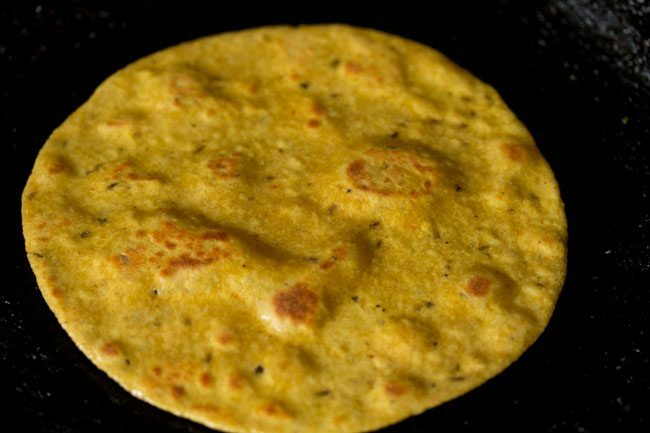 18. cook the paratha till you see golden blisters or charred spots on top and they are evenly roasted. 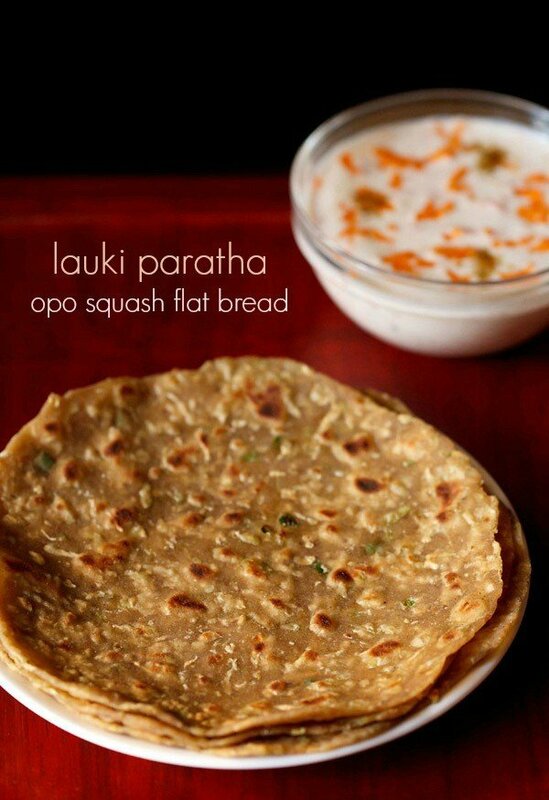 19. prepare all parathas this way. serve them hot or stack them in roti basket or a warm casserole. 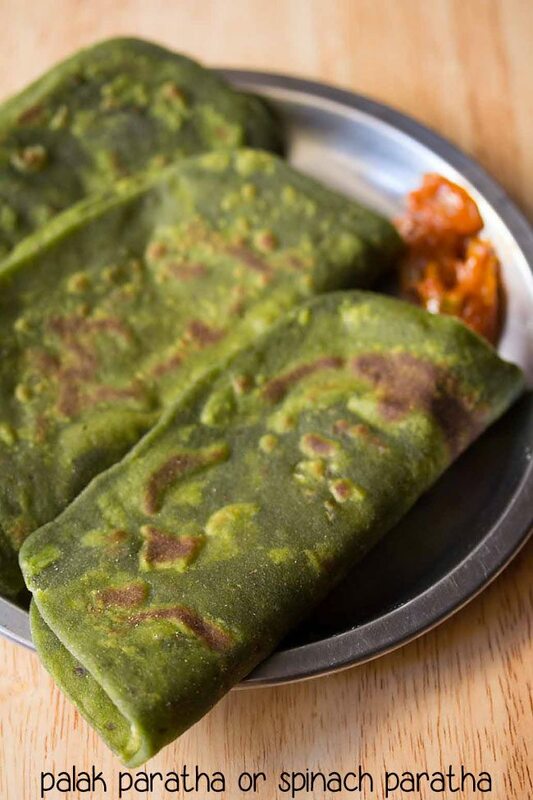 20. serve masala parathas hot or warm with any veggie dry sabzi or a gravy. you can also serve masala parathas with mango or lemon pickle or fresh curd. renu, you can add. the parathas will be tasty. 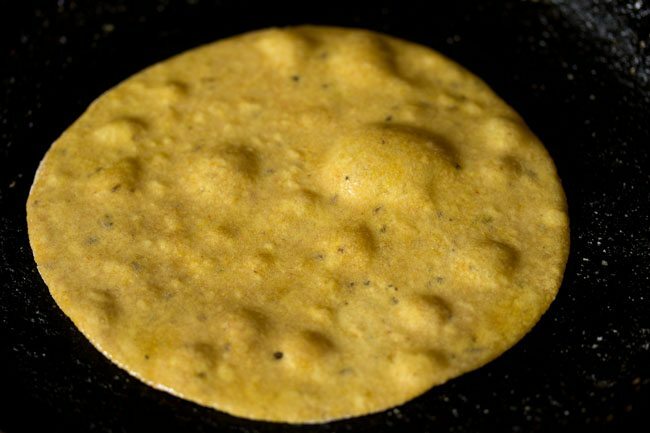 Is there a difference between Masala Thepla and Masala Paratha? welcome beena. in thepla curd is added, which gives a different taste than paratha. in parathas curd is not added. 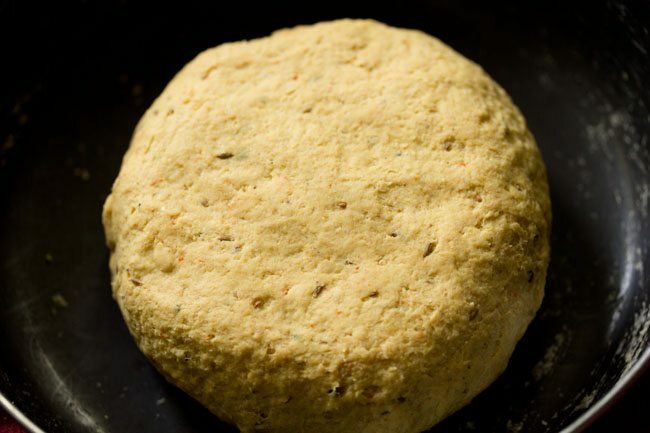 also in parathas ajwain (carom seeds) are used which are not used in thepla. so masala thepla will taste different than masala paratha. 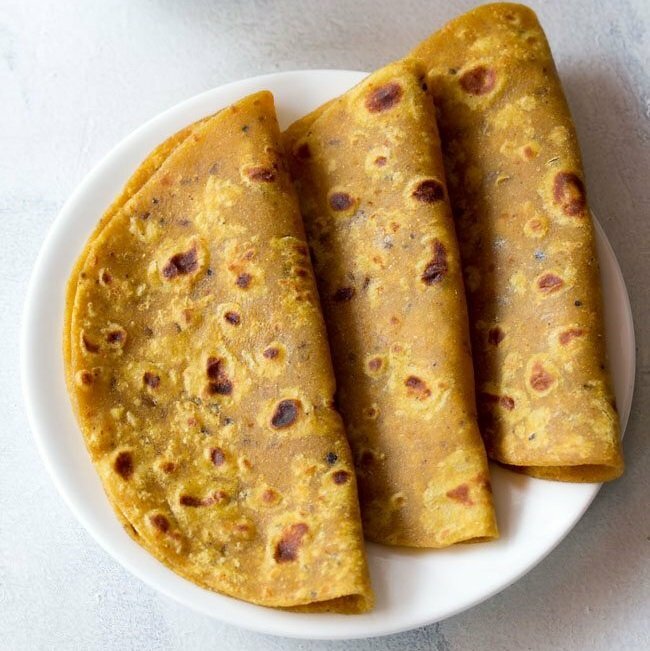 Is besan also added in thepla?If yes, what is the proportion of wheat flour to besan to be used?For 2 cups of wheat flour how much besan and curd is to be used? welcome beena. for 2 cups of whole wheat flour, you can add about 1/3rd to 1/2 cup of besan. curd can be about 1/2 cup. I tried Masala Thepla. 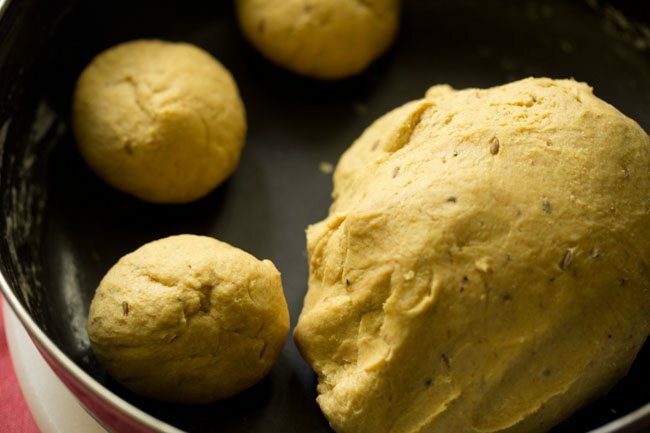 I used 2 cups of whole wheat flour,1/2 cup of besan,1/2 cup of Curd,1/2 teaspoon red chili powder,1/2 teaspoon turmeric powder,1/4th teaspoon cumin powder,1/4th teaspoon coriander powder,1 tablespoon oil,salt and water required for the dough.Is it correct or are any changes required? fine beena. cumin powder and coriander powder can be increased a bit. some garam masala powder can also be added, if you prefer. you can also add green chili+ginger paste. i hope the masala theplas tasted good. can you please tell me the measuring cup used?and how many Paratha it serves? please reply me..
measuring cup used is 250 ml cup. this will make around 10 to 12 parathas. thank you for sharing the recipe… as its very helpful for bachelor like us bcz time is less consuming and easy is to prepare. 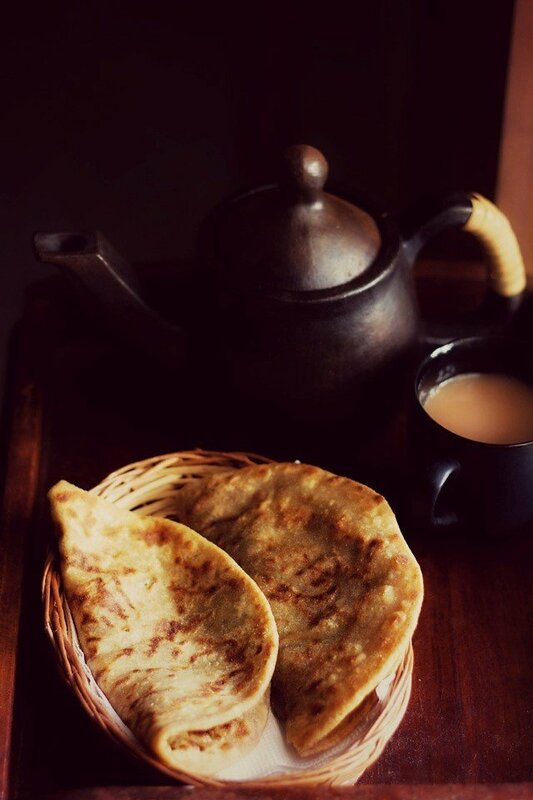 You can also have that paratha with tea it tastes delicious as evening or morning snack we usually these parathas with tea. It’s same like masala puri with chai. yes riya. we also have parathas with chai, infact both masala paratha and ajwain paratha. i sometimes even have plain paratha or chapati with tea. while writing the post, i forgot to mention it. before writing i did remember that i should write about having parathas with tea. but while drafting and writing the post, i completely forgot. thanks. i will update the post. Thank you for this recipe….will try right away. items marked in my favorite folder have disappeared ! if you update to latest version of app, then you won’t get this problem. this bug has been fixed in the latest version of app. Gave 4 stars by mistake.. Your recipes always deserve 5 stars? no problem ashrita. what matters to me is that the recipe should be a success for all my readers 🙂 thanks again. Could you please post rajma chawal recipe…. Though there are a lot of recipes across various websites, I badly want ur version as they have never failed me..
sure ashrita allow us some to post the recipe of rajma chawal, have taken your request on our file thanks. Thanks so much for considering my recipe request.. Waiting for the same.. ? sure ashrita you are welcome and thanks. wow, this looks tempting. will try the recipe. Thanks again for posting Dassana!